When it comes to brands and organizations that are dedicated to developing innovative products aimed at improving the health and lifestyle of pets, Hydro Kyle has definitely made its mark in the pet industry. Hydro Kyle started as a niche brand that developed and marketed a comprehensive array of products that aid in cooling humans and gradually ascended to developing products that help bring relief to equine and canine world. With the application of an innovative yet undemanding technology and science, Hydro Kyle has become one of the leading names when it comes to clothing that can alleviate extreme weather conditions and bring relief to dogs and horses. 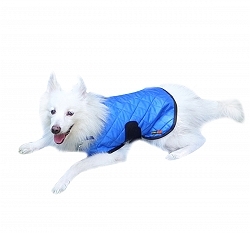 The cooling jackets have been specially designed for pets which are exposed to high temperatures. The innovative brand uses osmosis as the principal behind the working of the jackets. Each cooling product by Hydro Kyle is made with a soft thermal blend 100% cotton pulp fabric. You too can purchase premium cooling jackets on DogSpot.in for your canine friends and protect them from the effects of high temperatures and harsh climates. Hydro Kyle cooling jackets are made with an absorbent hydrophilic and hydrophobic material that conserves the absorbed water and release it through evaporation and thereby keeping the wearer cool and comfortable.